During the first six years of its existence, the Sheldall Schoolhouse simply kept a running list of the enrolled students, making it difficult to determine when each student actually began their education at the schoolhouse. It is also difficult to determine when a student would have graduated from the Sheldall Schoolhouse. Due to the labor intensive nature of farm life, children were often forced to put their education on hold in order to help out around the farm. 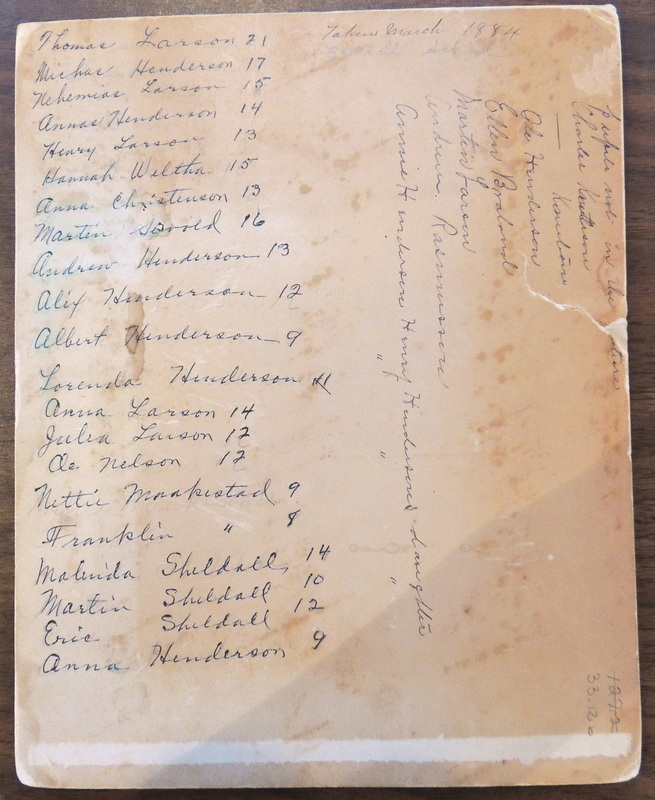 The following list can be found in "The Sheldall Schoolhouse: Historical Sketch," and simply outlines when students enrolled in the Sheldall Schoolhouse and their teachers for each term. Rasmus, Anna, Malinda and Erick Sheldall; Henry, Oscar, Anna, Betsy and Tom Henderson; Ole, Anna, Sam, Oliver and Malinda Larson; Lewis, Catherine and Taurina Charlson; Ole, Tome, Endre, Andrias and Aasa Braland; George H. Thompson; Valencia and Florence Biggs; Sarah Griffith; Bertha and Helen Christenson (Tjernagel); Olog, Caroline, and Malinda Olson; Charles, Emily, Albert, and Olof Knutson; Dave and Tom Reagan; Charley and Betsy Charlson; Andrew, Carrie, and Henry Williams; Joren Boyd; Emma, Amy, and Louise Walters; Ole and Osmund Ritland; Mary Owenson; Christen and Lars Christenson (Tjernagel); Andrew, Martha and Ida Anderson; Knut, John, and Betsy Knutson; Nels Peterson; Peter and Bertel Pearson; Will and R.L. Montgomery, Syvert Syvertson, Andrew Knutson, Martha Sheldall, Anna Skimmeland; Thomas and Christian Knutson; Mary and Julia Olson; Betsy Pearson; Ada, Clara, and Alba Hall; Sampson Wier. It is very likely that the sudden increase in female teachers after 1863 was due in large part to men leaving to fight in the Civil War. Anna Knutson; Elsie and Anna Bergeson; Sam Anderson; Helen, Sarah, and Knut Knutson; Erick England; Edwin Owenson; Afin and Julia Afinson. William, Charley and George Olmstead; Frank Wier; Ole and Isabelle Johnson; Isabelle Knutson; Ole Olson; Cecelia Scott; Oliver, George and Thomas Boyd; Jake Egland; Andrew Larson; John Johnson. Lewis J. Tjernagel; Hannah Thompson; Lizzie Olson; Jacob Weltha; Charlie and Lewis Johnson; Ono Olverson; Martha Knutson; Lena Ludvig. Martin L. Henderson, Peter G. Tjernagel; John Larson; Swen Larson; Mary and Anna Thompson; John Carston; Anna Charlson; John Loss; Sarah Ludvig. Charlie Charlson; Betsy, Caroline, and Erick Charlson; Julia Knutson; Lena Weltha; Ellen Thompson; Tobias Larson; Randy Larson; Lizzie Braland; Oliver and Andrew Anderson; Jane and John Ludvig; Jacob Wilson; Mattie and Stone Mortvedt; Hans C. Gydeson. Lonnie Johnson; Malinda Knutson; George L. Thompson; Betsey Wilson; George Johnson. Ole Knutson; Berge Ponsnes; Michas Henderson; Henry and Nels Henderson; Harry and Nellie Larson; Bertha Larson; Canute Canuteson; Ole J. Sandness; Eric Sheldall; John Halvorson-Mickelson. Annie Charlson; Annas Henderson; Henry Nelson; Nehemias Tjernagel; Thomas Johnson; Martha Weltha; Jennie Wilson. Hannah Weltha; Anna Knutson; Belle Williams; Severin Holverson-Mickelson; O.T.V. Thompson; Henry M. Tjernagel; Martha Larson. Malinda Sheldall; Virginia Wier; Hannah Braland; Edward Braland; Zebulon and Gerhard Morrison. Lewis Sheldall; Andrew L. Henderson; George and Mary Christianson; Joseph Johnson; Charles Knutson; Joachim Espe. Lorenda Henderson; Annie and Jennie Christianson; Alex Henderson; Annie Larson; Hannah Charlson; Martin Sheldall. Sarah G. Olson; Betsy Johnson; Henry T. Anfinson; Minnie Nelson. 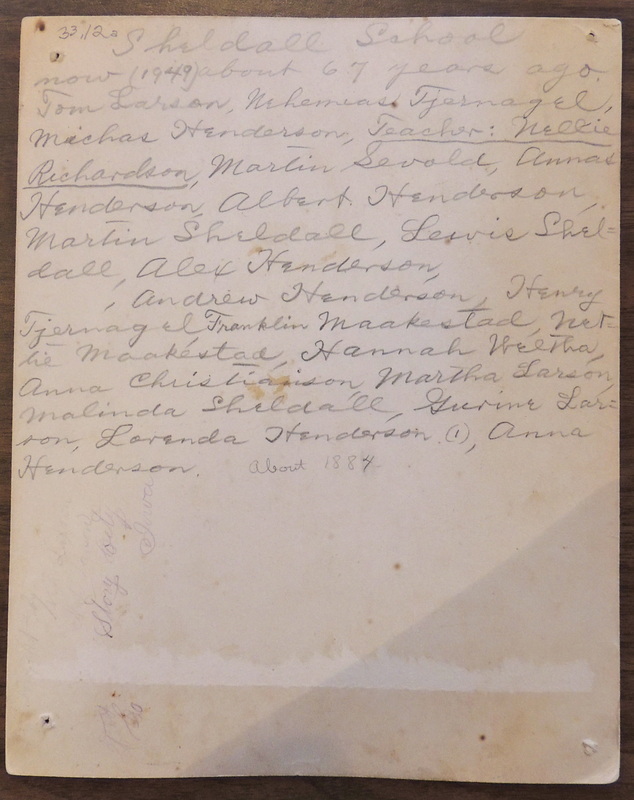 Taurine Knutson; Ole and Annie Peterson; Isabelle Larson; Andrew, Lizzie, Anna and George Anderson; Martha Olson; Sivert Opstvedt; Julia Larson; Albert Henderson. Mathila Christianson; Ole Nelson; Mary Charleston; Anna Henderson; Nettie and Franklin Maakestad. Theodore Knutson; Helen and Betsy Shaw; Andreas Rasmusson; E. Johnson; Christ Adolph Sakarisson. Hans Johnson; John Sandness; Malinda Larson; Martin O. Tjernagel; Lewis Charleston; Martin Sevold; Hans and Knut Larson; Aggie Frette. Ellen Braland; Ole J. Henderson; Henry Afinson; Andrena Larson; Annie Sandness; Annie Henderson; Thomas and Alex Rasmusson; Henry Henderson. Jennie and Minnie Hanson; Bertha Johnson. 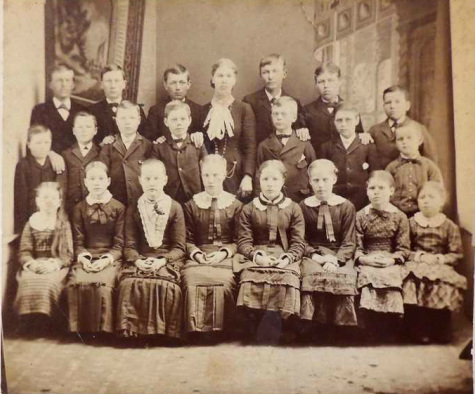 Above is a photo taken in 1884 of the Sheldall School students. Two of these photos have been donated to the Museums of Story City, and in both cases the donors were kind enough the record the names of the students on the back. In the photo on the left, you can see that the donor wrote the names of the students according to the row they were sitting in, but had difficulty remembering the names of three of the boys in the second row. The photo on the right has the names of the students and their ages, but they are not in any particular order. By comparing these two photos we were able to match the ages to the students and identify the three unknown boys, although we cannot be sure which boy is which. There was also another small discrepancy in comparing the two photos. In the photo on the left, two of the girls are identified as Martha and Gurine Larson, and in the photo on the right they are identified as Anna and Julia Larson. It is possible that these young girls were simply taking on more Americanized versions of their traditional Norwegian names.